"Customized your brand name and logo with this custom printed Oakridge Cup at Vivid Promotions Australia. 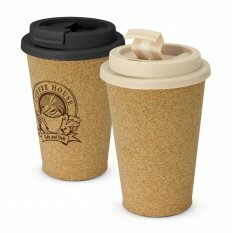 This reusable coffee cup comes with a unique soft touch natural cork outer coating that insulates the cup and ensures it is not too hot to hold. It is manufactured from tough food grade polypropylene and has a secure screw on lid with a splash proof flip closure. Some more features are: Colours: Cup: Natural, Lid: Natural, Black. Size: Dia 90mm x H 140mm Carton Dimensions: 47 cm x 47 cm x 40 cm Carton Cube: 0.09 m³ Carton Quantity: 250 pieces per carton, Loose packed Carton Weight: 13.5 kg Minimum Qty: 50 Leadtime: 2-3 week. Decoration: Pad Print: 40mm x 40mm Wrap Screen Print: 80mm x 50mm Visit our website at vividpromotions.com.au for more details about this promotional products."